It’s so easy to go to the grocery store and pick up a loaf of bread, but what if you made your own delicious pizza bread from home? This sun-dried tomato filled Pizza Bread is for you if you 1) have never made bread before, 2) haven’t made bread before but would like to without it taking hours, or 3) if you want to have fun in the kitchen making something homemade and delicious that tastes exactly like pizza, but isn’t pizza! I’m biased here, but truly, this gluten-free sandwich bread is as good as making a quick, healthy, and the delicious homemade bread gets. Our family makes homemade sourdough, which I would love to get into and learn more about, but until then, we have this easy blender bread that gets only a couple dishes dirty and cooks for about 40 minutes. I can easily eat a whole loaf of this bread by myself in one week. 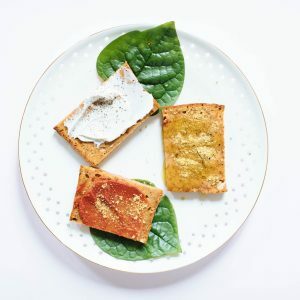 I love enjoying it for toast with avocado, like sandwich bread, or slathered in non-dairy Classic Cashew Cheese with a sprinkle of salt, pepper, and fresh basil. Another delicious way to enjoy this is Cheesy Dust and a drizzle of high-quality olive oil with fresh black pepper, it’s so delicious. But if you’re not so keen on eating it all in one week or sharing, you can easily freeze this for later. To freeze, I recommend allowing the bread to completely cool, slice, then lay each sliced in a single layer in an airtight glass container. What about baking with heat sensitive oils and fats? Omega-3 oils are a bit heat sensitive, so use whole flaxseed in this recipe and start with raw cashews. However, the monounsaturated fats in the cashews do not change during baking or decrease. Some studies show there isn’t a significant breakdown of or loss of healthful fats during baking (1). If you’re following the NS lifestyle and consuming nuts and seeds the majority of the time in a raw, unsalted state, having some baked goods with nuts and seeds is still healthful and a great alternative to store-bought gluten-free bread. You know the beautiful red color from tomatoes and sun-dried tomatoes in this recipe? Red, orange, and pink whole foods are rich in antioxidants, mainly lycopene (a carotenoid) which is responsible for giving these whole foods it’s the beautiful color. Lycopene has been studied and shown to help reduce a variety of cancers, help improve circulation, decrease high blood pressure, reduce cholesterol, reduces cardiovascular risk, and reduction in metabolism syndrome (2)(3)(4)(5)(6). We need antioxidants from our diet because they protect our body and help fight off free radicals — free radicals can damage our healthy cells causing oxidative stress, which may cause harm to our hormones, blood vessels, proteins, lipids, and genetic code; causing cancer, inflammation, pain, degenerative diseases, heart disease, and aging itself. Preheat oven to 325 F degrees. Using a high-speed blender, add all wet ingredients (eggs, maple syrup, sun-dried tomatoes, garlic, and cashew butter) to the blender and blend until creamy, for about 1 minute. In a large bowl, add the dry ingredients to mix with the wet ingredients from the blender: almond flour, baking soda, salt, lemon juice, dried oregano, and flaxseed until well combined. Pour this mixture into a greased (with coconut oil) 5 x 9-inch bread loaf pan or a silicon baking dish. Spread the dough evenly into the bread loaf pan and bake for 60 minutes until a tester comes out clean. I recommend checking it at the 45-minute mark. As always, store in an airtight glass container that we recommend from the NS Shop. You can also slice and freeze for later, toast upon serving, or keep it in the fridge for up to 2 weeks. Manthey FA, Lee RE, Hall CA 3rd. Processing and cooking effects on lipid content and stability of alpha-linolenic acid in spaghetti containing ground flaxseed. J Agric Food Chem. 2002 Mar 13;50(6):1668-71. Etminan M, Takkouche B, Caamaño-Isorna F. The role of tomato products and lycopene in the prevention of prostate cancer: a meta-analysis of observational studies. Advances in pediatrics. Published March 2004. Silveira JQ, Dourado GK, Cesar TB. Red-fleshed sweet orange juice improves the risk factors for metabolic syndrome. Advances in pediatrics. Li YF, Chang YY, Huang HC, Wu YC, Yang MD, Chao PM. Tomato juice supplementation in young women reduces inflammatory adipokine levels independently of body fat reduction. Advances in pediatrics. Burton-Freeman B, Sesso HD. Whole food versus supplement: comparing the clinical evidence of tomato intake and lycopene supplementation on cardiovascular risk factors. Advances in pediatrics. Han GM, Soliman GA, Meza JL, Islam KM, Watanabe-Galloway S. The influence of BMI on the association between serum lycopene and the metabolic syndrome. Advances in pediatrics. Published April 14, 2016.